The HD ExpressCard kit contains a standard ExpressCard/34 adapter (cable included) that allows you to connect your HDX-SDI or HD Express video interface breakout box to a Mac or PC laptop computer. Most current-generation high-performance PC laptops, including Apple MacBook Pro computers, are equipped with ExpressCard slots, a new, faster PC card slot format that has replaced PCMCIA. 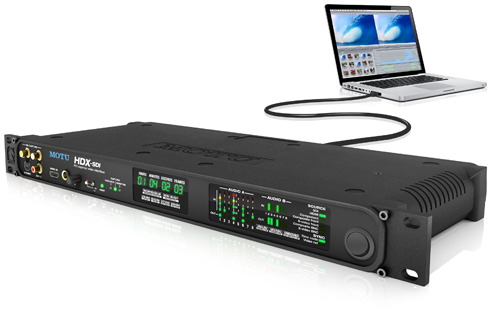 On these portable systems, the HDX-SDI and HD Express interfaces give you broadcast-quality capture and monitoring. With the enormous performance gains seen in laptop technology, laptop computers are now powerful enough to easily capture and play back both HD and uncompressed SD video. You can essentially build a complete capture/edit system that fits in a backpack. There's another major benefit for using ExpressCard connectivity to a laptop for video I/O: doing so frees up the FireWire port on your laptop for professional-grade video storage solutions, which offer enough storage space and access speed to support the most demanding HD and uncompressed SD workflows. The included cable is a standard HDMI-to-mini-HDMI cable with a length of six feet.